We are more aware than anyone how many choices you have for cloud storage, so why should IDrive computer backup be the one you pick? While we may have originally been attracted to IDrive because of their encryption protection, external hard drive backup and mapped drive support, there are other reasons why it has become so popular with everyone else. IDrive computer backup service has been our #1 pick for a long time and whenever someone else gets close to unseating them, an upgrade to IDrive locks them securely in the top notch. IDrive clearly is a leader in the cloud backup industry, they have been at it a long time and they spend more time and money on development of a better product than they do marketing. So many other companies have that backward. Remote Management Feature – If you are away from home and need a file? Edit your backup set remotely to grab that file or folder so it’s backed up to the cloud where it is accessible to you anywhere, even from your mobile device with one of IDrives great mobile apps (Apple, Android). True Archiving – This feature is one of our favorites as well. We know from experience working with business clients and individuals that you do not always realize that a file has been deleted accidentally within a 30 day time window that other computer backup services may provide file retention for. With IDrive computer backup, the only files deleted from your cloud account are those that you specifically tell it to delete. No Bandwidth Throttling – Some online backup services offer “unlimited backup” but after a certain amount of uploading you find they have throttled your account to the point that it is practically worthless. While the IDrive backup software allows YOU to set throttling and bandwidth scheduling for your benefit, IDrive does not slow you down in getting your data to their protected servers. IDrive Express – We just wrote about IDrive Express service to let you know about this relatively new offering by IDrive to provide hard drive upload and retrieval at NO COST to you! No one else in the industry is offering this (although IDrive may end up leading them to do it!) All new paid signups – business and personal! 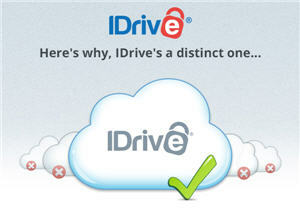 – can receive a 1TB IDrive Express hard drive, at no cost to them, to speed up their initial upload. You can backup your critical data and mail back the drive, getting your initial upload done in days instead of weeks. With competitors, this feature can costs hundreds of dollars, IDrive now offers it for FREE! Hopefully you are starting to see the difference between IDrive computer backup where backing up your computer is of the utmost importance versus some of the competitors that are big on glitz, big on coupons and emails offering you a better and better deal until you succumb – but low on features. The one idea I don’t want you to walk away with is the idea that a cloud based computer backup service that offers all this must be hard to use or expensive; IDrive is neither. IDrive offers a LIFETIME free account of 5GB (IDrive Express not included, though, obviously) which is more than most others. But the PAID accounts are so inexpensive it becomes a no-brainer to signup. No fancy tricks, sometimes a simple coupon code and that’s it. No high pressure “today only” sales techniques. AND, IDrive computer backup software is easy to download, install and setup to get your data protected quickly. Want to learn more or get started right away? Click here to head over to IDrive. Filed under IDrive and tagged computer backup. « IDrive Express: Hard Drive Upload/Restore – Included For Free! I am beginning to suspect that this website is owned and operated by idrive. What is going on here? Every post is to push idrive. Hey, this is 2013 and the good old days of pushing products are behind us. Not at all, this website is independent. Who are you, a competitor? When we spend a lot of time working with a particular product, we write a lot about it. Where were you when we were writing a lot about SOS online backup? Or Zoolz? Why is it suspicious that we don’t spend a lot of time writing about mediocre products and instead concentrate on the ones we have found to be the best? What the buyer needs to beware are all of those sites with B.S. reviews and they never really used the service.